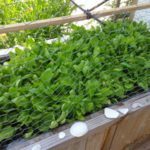 First harvests of 2016 – the spinach! 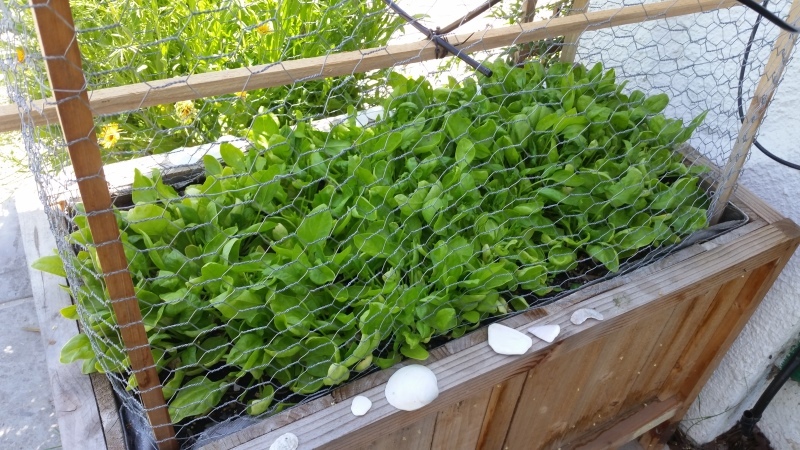 Deck planter full of spinach. Also, notice the drip irrigation I’ve installed over it? Wow, what a difference a month makes! I’m back from out of town, and wow, a lot has happened! My garden has started producing like crazy. There’s actually too much to take in all at once, so I’ll make this a couple of posts. First, the spinach… I got two harvests out of the spinach. 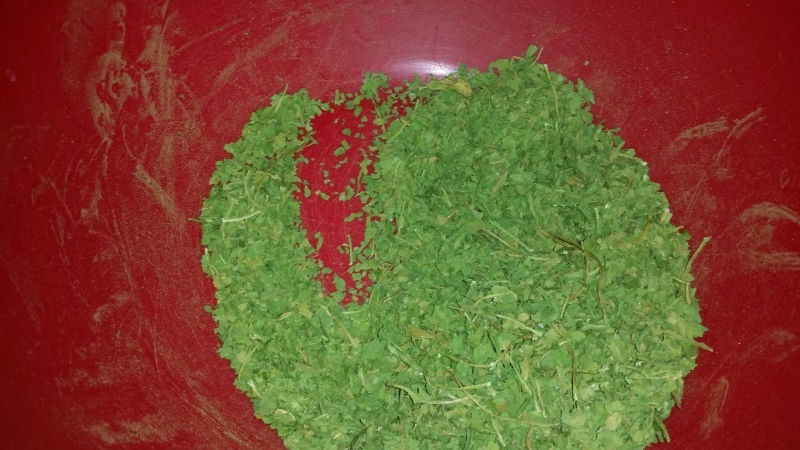 I cut the spinach like grass, just “mowing” it a little down to size. 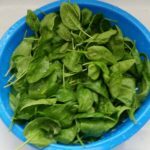 The spinach leaves are just a little bigger than baby spinach leaves, and very firm and full of juice. So of course I used them in two different recipes that removed that juice! 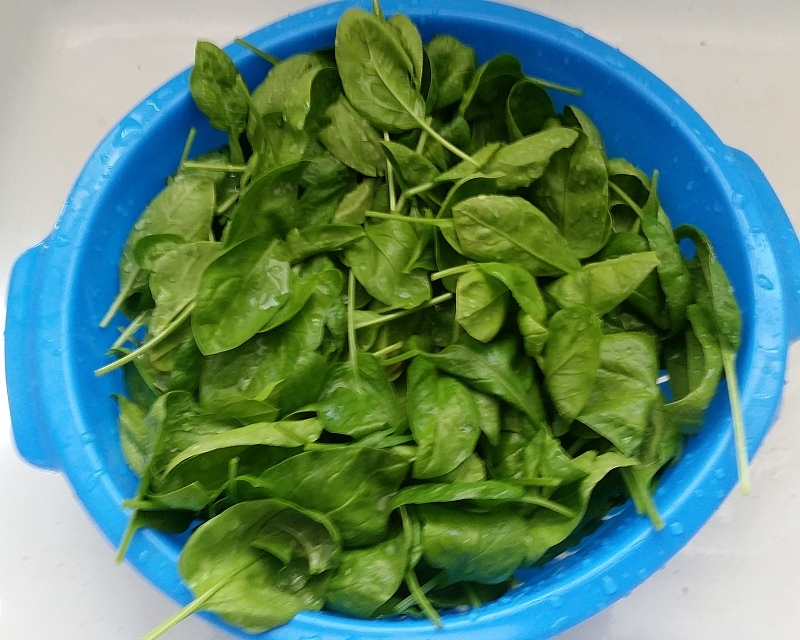 Okay, I know that seems weird, but from what I can tell, my deck planter is going to be producing a LOT of spinach over the summer, and I’ve got to find ways to use it all, and to store it for later. 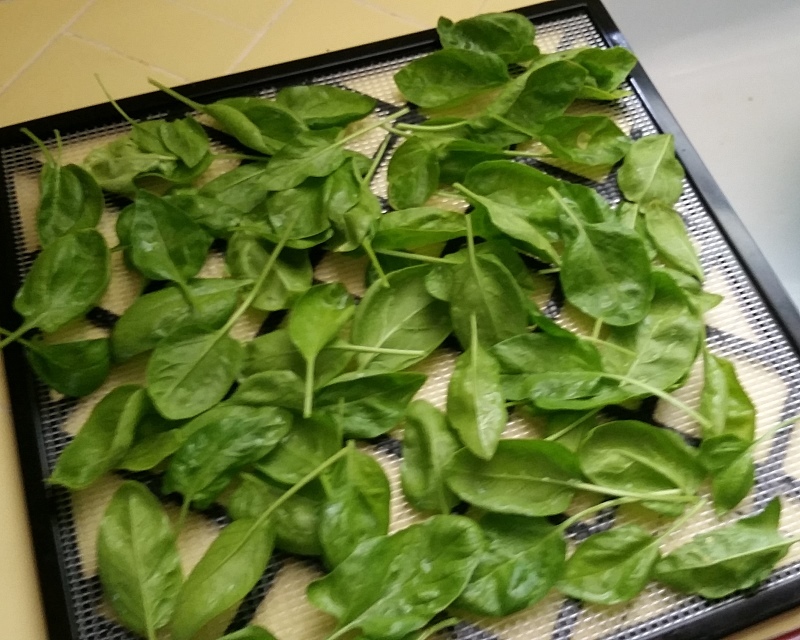 My first idea was to store the spinach… by dehydrating it. 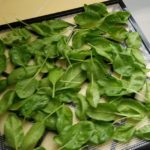 So I washed it clean, and loaded up my dehydrator with spinach leaves. It dehydrated very quickly, in about 3 hours it was mostly dry. 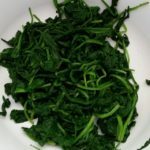 Some things I learned from this is that the fan in the dehydrator is strong enough to blow the dry spinach around… so I need to do something about that. (Perhaps put another dehydrator grill over the top? hmmm..) The next thing I learned is that I should pick the leaves so that they leave the stems behind. 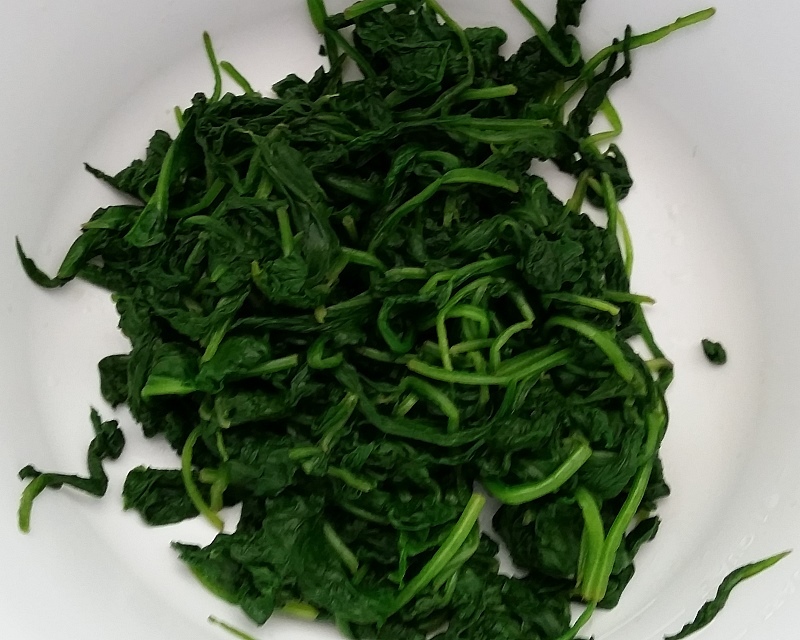 What I got was a lot of very brittle dried spinach leaves that crumbled almost as soon as I touched them. Just using my hands I crumbled them to powder in a bowl. 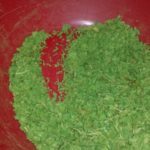 No officer, that’s not an unlawful herb! A lot of spinach turned into something very small. I tossed it all into a ziploc bag, and tossed that into my freezer. The next time I make a soup or stew, I’ll just toss it in there. I’ll bet it would go great with ramen! This is what it is supposed to look like! And speaking of ramen, I used the next batch of spinach to make a Korean dish called, “Sigeumchi-namul” (시금치나물). 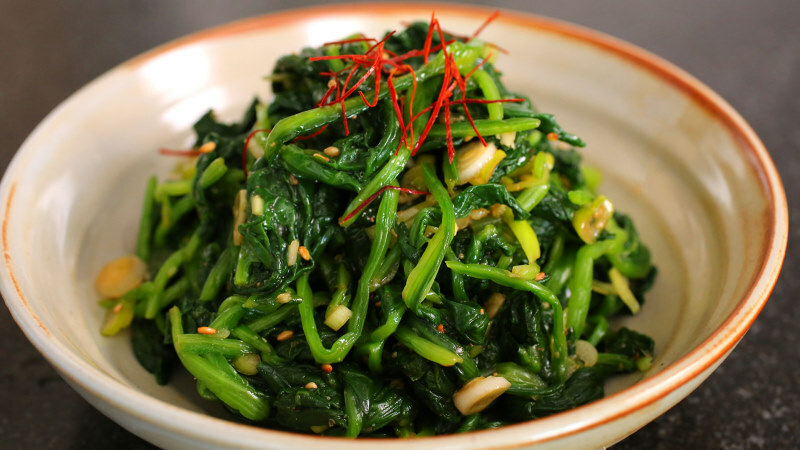 It’s a traditional Korean side dish (banchan) that uses blanched spinach. It is a dish I fell in love with the first time I had it while stationed in Uijeongbu. I’ve used the recipe from the Maangchi Korean recipe website. Blanched for 63 seconds. TOO LONG! Basically you blanch the spinach, rinse it and squeeze the water out of it. Then you add garlic and chopped onions. You add soy sauce and sesame oil in equal portions. And you sprinkle it with sesame seeds. It is delicious! But I haven’t made this recipe in almost ten years. I forgot that you should only blanch the spinach briefly. The recipe calls for 30 seconds to one minute… I would recommend 30 seconds and no more! Otherwise it stops being crisp and starts being mushy. Bleh. The persimmon trees are doing well! So one persimmon tree is under the privet tree. It isn’t under the bird feeders I keep in the privet tree, but apparently some of the birds like to hang out above it. I’m a little concerned about the bird poop on the persimmon leaves, but I don’t think it is a big enough deal to worry about. I was also concerned that the privet tree would be keeping the persimmon in the shade, but the shade is only there through the midday. The persimmon is getting morning and afternoon sunlight. Still, the days the privet tree has left are definitely numbered! 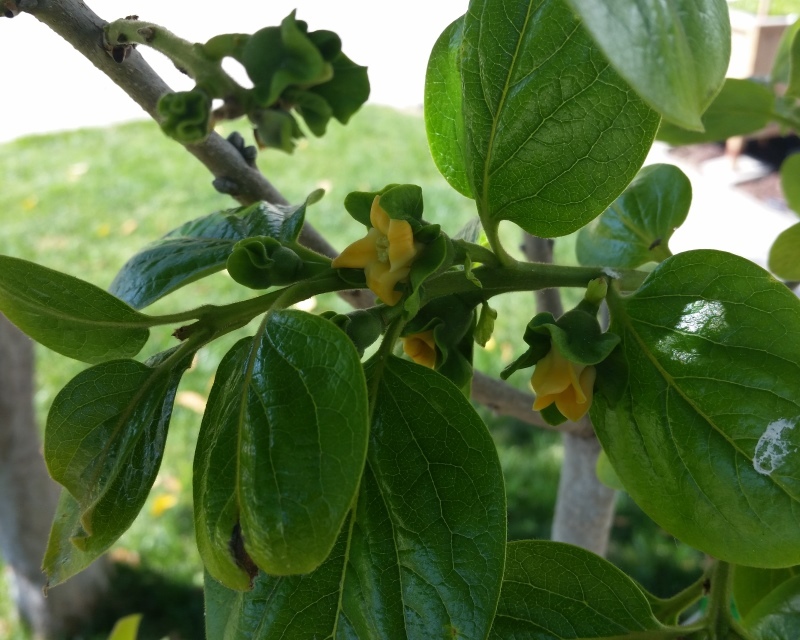 The blossoms on the persimmon are smaller than I thought they would be. The whole point of Backyard Harvest is for me to learn the tools of permaculture and sustainability, and to tell you how I’m doing while I do this. Well, I want to point out that I’m not in this alone. My wife is also very interested in do-it-yourself crafting with the idea of learning how it is done. Wendy is currently into making soap, and is having a great deal of fun doing it. Making soap isn’t something that interests me, but I am more than happy to support her in this. And I have to admit, I love the results! So if you’re interested in home made soap, I’ll invite you to look at Wendy’s Facebook page. Be sure to “Like” the page, and if you see any up-and-coming soaps that you must have, send her a note, and she’ll make sure you get a couple bars. You can check out Wendy’s Facebook page, which also has a link to her Etsy page, by clicking on her website URL: www.gypsycrafts.com. In the past when I’ve planted beans or corn, my crops have failed. So I’m always looking for something new to try, something that will provide calories and be good to use and store. Two eggplants in the foreground, the blackberry canes are tied to a wood support in the corner. Last year I tried eggplant. Just one, to see what it would do. What it did was get much bigger than I expected it to get! It was huge, and it took over part of my garden. And from that I got one single perfect eggplant. That was a disappointment. But it was a hardy plant. The ants left it alone, and it didn’t seem to have many other predators. So after my reading, I decided that the problem was that it produces better when there is another eggplant nearby. 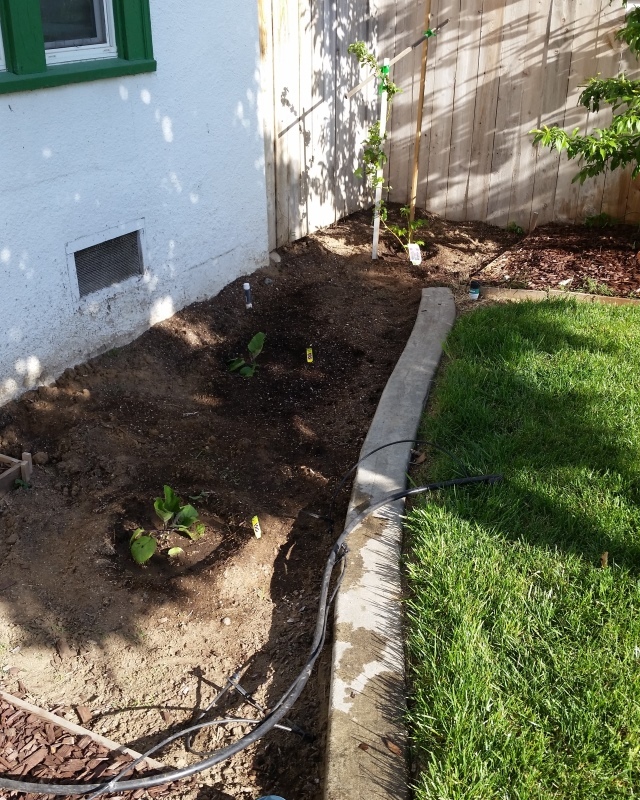 Going from this theory, I got two eggplants and planted them in the North garden. I fully expect these two eggplants to take over in that area of the garden, so I’ve not planted anything else there. But there was still an empty spot in the Northwest corner of the north garden… and I decided that was the perfect spot to move my blackberry plant into. The blackberry plant had disappointing results. It failed to thrive, and it failed to produce. That’s mostly due to my fault since I had placed it in a pot with an automatic drip watering system applied, and then failed to notice when the drip was dislodged by cats, and the blackberry stopped getting water during the heat of the summer. No wonder it failed to thrive! So I replanted it in the unused corner of my garden, and have reused the pot for pups off of my aloe vera plants. Aloe is much more forgiving of missing a watering period during the summer. There are only two blackberry canes, and I tied them to a wood support. We will see what happens next. 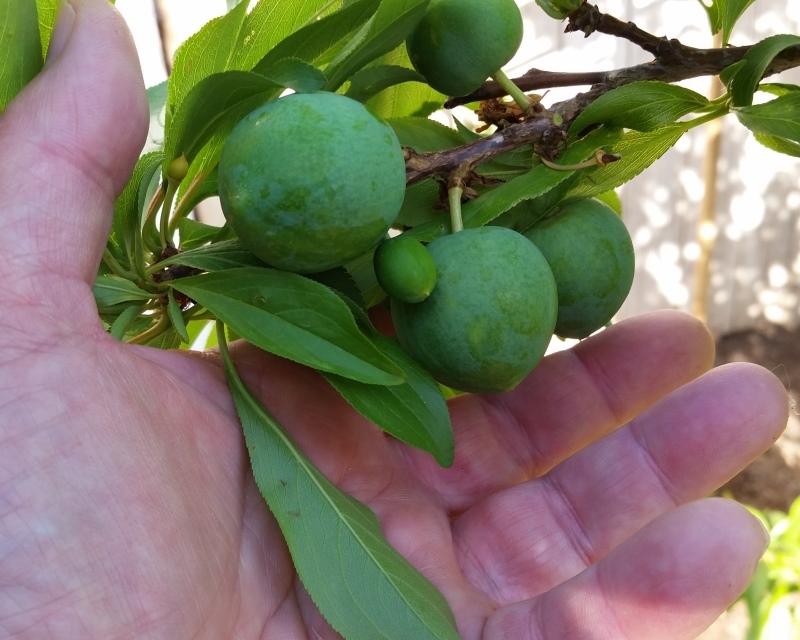 The fruit trees on the north side of the yard are doing well. They’ve all lost their blossoms, and are now in full foliage. This is the first I’ve seen of how they really look. In the last two years these trees were basically just sticks, and I couldn’t get a good idea of what they would turn out to look like. Now I know that the pluot is tall, with a strong trunk. The white nectarine is almost like a willow tree in how it droops. I will have to prop up some of its branches with additional supports. The white peach is reaching out in all directions like some sort of crazy tree made out of pipe cleaners. 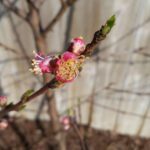 I’m constantly “pinch pruning” new growth from it, and for a lesser extend from the white nectarine, in order to discourage growth over my fence and over the sidewalk. At the end of the season, when these trees go dormant, I’ll be very aggressive in pruning them into an espalier pattern. The orange tree is doing well, as always. The oranges are already starting to get bigger than a grape. It’s nice to see. 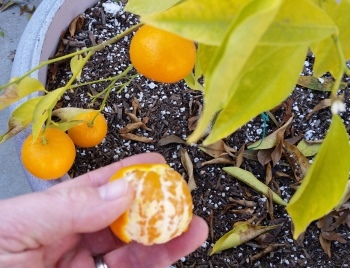 I spent some time giving the orange tree fertilizer. 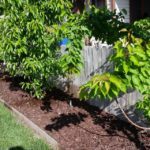 Instead of using Jobe’s fruit tree spikes, this year I went with a liquid fertilizer from Jobe’s. I like Jobe’s. The Jasmine is in bloom. The grapes are too, but you can’t see that here. I planted 6 different pepper plants this year. Three of them are Anaheim chili – because they go so well with everything. I can’t wait to start adding fresh Anaheim’s to my food. I chose the gypsy pepper because I liked its looks, and my wife will enjoy eating something that is only slightly spicy. I didn’t plant Serrano peppers this year because I’ve already harvested a LOT of Serrano peppers, and have almost a full quart of Serrano ground chili pepper to use as seasoning! Maybe next year. Actually, I think I’ll be investigating the peppers offered by the Chile Pepper Institute of New Mexico State University. I’ll be looking for flavor, heat, and how well they store. 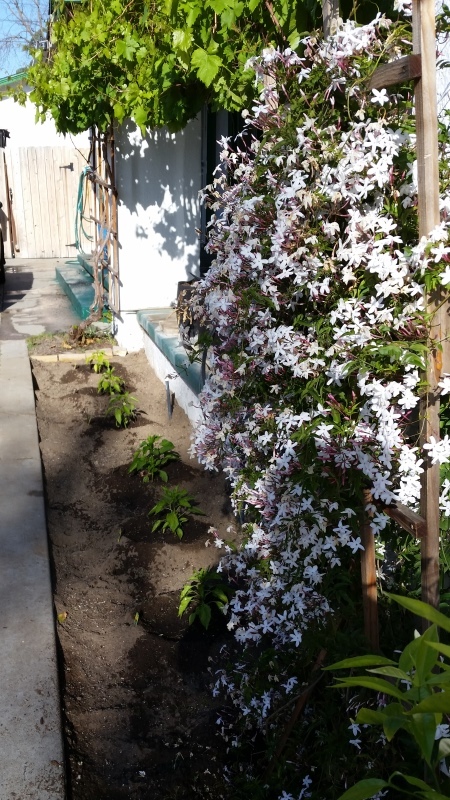 As you can see from the image, I’ve also got Star Jasmine planted, along with my grape vine. The grape vine has taken off again this year… and I’m giving it extra water to see if I can keep up with its demands. Its in flower right now, and I expect there to be a LOT of grapes. Next up is the plants in containers. 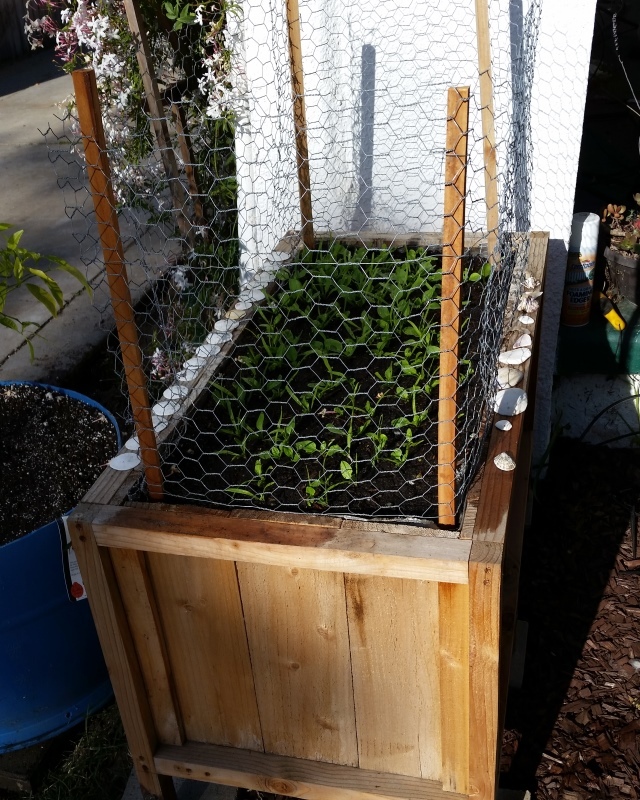 Kitty proofed deck planter filled with spinach! This year I moved my deck planter off of my porch, and just in front of the southeast corner of my house. It gets full sun here until about 1pm every day. I’ve added a little fertilizer and planted spinach here. Nothing but spinach! 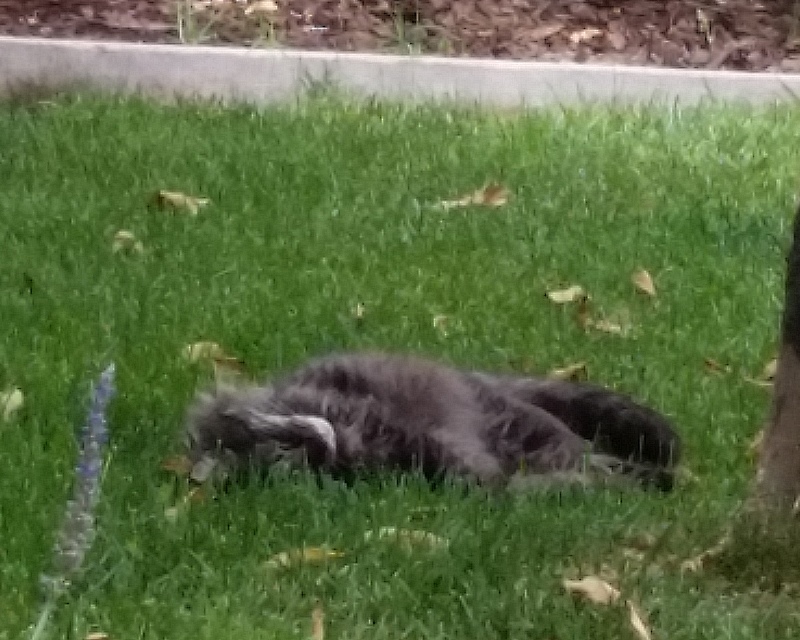 The first day after planting, I stepped out of my house and found one of my cats lounging on the planter’s soil, in the sun. 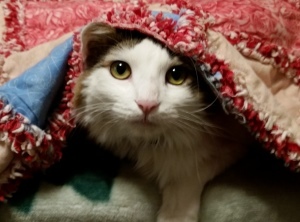 She was clearly enjoying herself, and happy with her new “bed”. Luckily for me, she didn’t dig anywhere, or leave anything behind. This has taught me that I can’t leave a planter unprotected, so I used a little chicken wire and some stakes to cat-proof the planter. No worse for wear, the spinach started poking out. I’ve planted it VERY dense, and will be looking for ways to use up a lot of spinach very quickly. I’m also looking for ways to store spinach. As a reminder, you can download plans for this deck planter here. Last, I’m taking a look at my “potted forest” from the back yard. The honey tangerine trees DID actually produce last year, but they have not flourished. They’re weak and wimpy. The cherry tree didn’t get enough water last year and the main trunk died. There are some suckers that are living quite happily, but I think I will just let the whole tree go. But I still want to try to save the tangerine trees. So after doing some reading, I have come to the idea that the pots are too small, and the soil is incorrect. 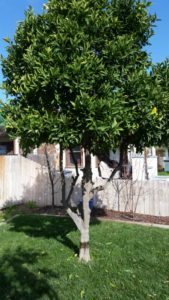 Citrus trees need soil that is more sandy. They need something more like what I use for my aloe plants. So I made a quick trip to the home improvement store, and after some consideration purchased a bag of soil designed for potting citrus and succulents. I then re-potted one of the tangerine trees to a 28 gallon planter made out of half of a 55 gallon barrel. There are drainage holes on the bottom of the barrel, and it is sitting on paving stones in the SE corner of the garden. It looked pretty bleak just like that, so I added a mix of flower seeds around it. The mix is to attract butterflies. I hope it works out. I may replant the second honey tangerine, but I’m not sure if I’ll do that just yet. I may wait to see if there are any improvements on this guy first. The oranges have been harvested. 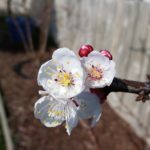 You can see the northern privacy fence in this photo, behind the pluot and white peach trees. There is still a possibility of a freeze, so I haven’t gone all out in planting as yet. Right now, I’m doing clean-up. However, this is the right time of the year to plant new trees, so I’ll be doing that too. At this time of the year I’ve harvested all of the oranges off of the tree. The next step is to haul out the ladder and trim the tree back into shape. I like the tree to stay somewhat compact, and I don’t allow suckers to grow any lower than about 6 feet. The idea for me is that the tree won’t block my view… so no foliage lower than about 6 feet. 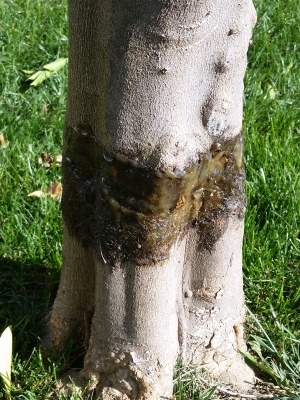 Also, the longer, newer growth from the top of the tree gets frostbitten and wilts or dies. Together with being shaggy looking, I’m happy to trim it back. 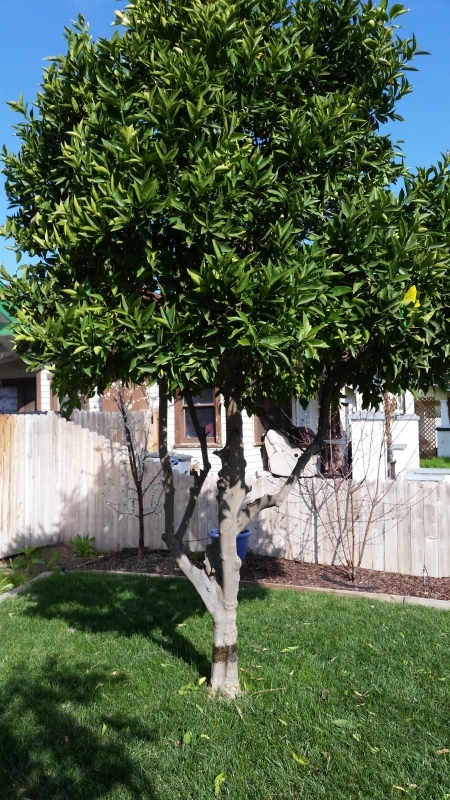 While trimming, I can see that the orange tree is getting ready to bloom. (sigh) I have a love/hate relationship with orange blossoms. They smell soooo good. And I’m allergic to them. Worse, since I’m in an area that has orange orchards everywhere in the valley, the whole season is just miserable for me. Time to break out the anti-allergy meds! After I trimmed the tree, I broke out the Tanglefoot. This is an insect barrier that is proof against the Argentine Ant. I’ve written before how this ant has decimated my crops in the past. They will also swarm my orange tree, causing it unnecessary stress. A border of Tanglefoot around the base of the tree keeps them out of my tree entirely. I also tanglefoot my other trees, and any planters I might use. Tanglefoot around the base of the orange tree. 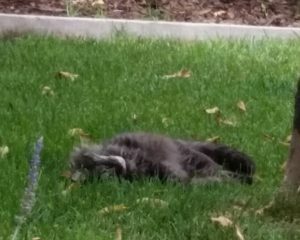 Also, if you feed a pet outdoors, use Tanglefoot along the outside of the dish so that pests can’t crawl into the bowl. 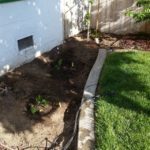 I’ve placed a Tanglefoot barrier around the base of my pluot, white peach, and white nectarine trees to the north of the yard. 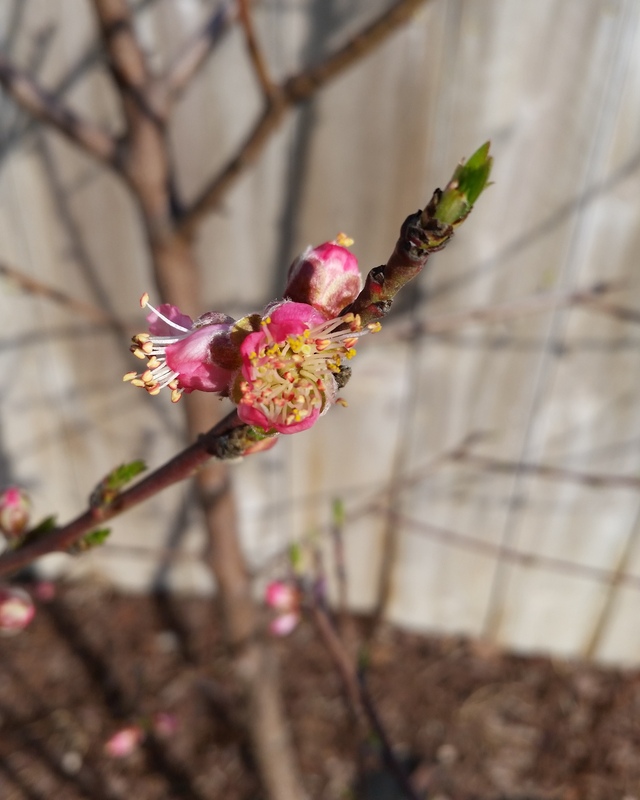 The other fruit trees are just starting to come into bloom now. 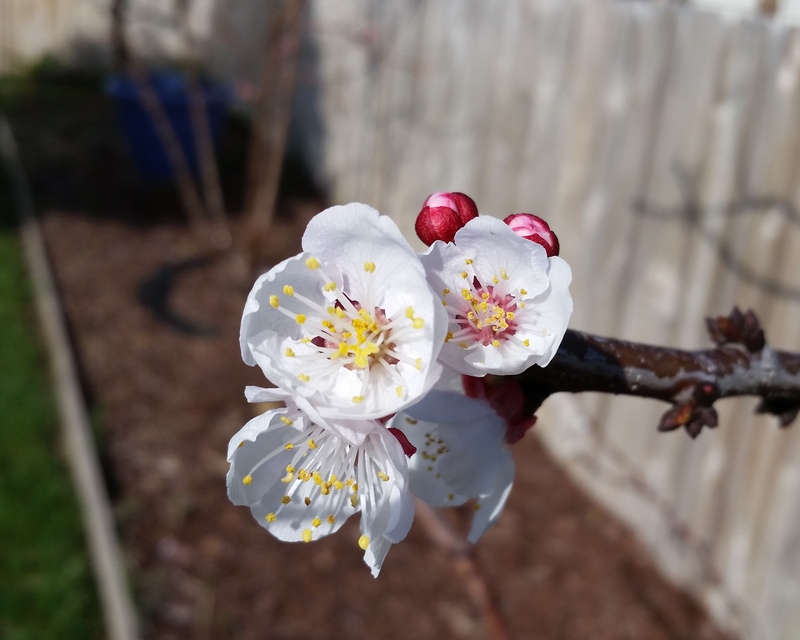 The blooms for the white peach and the white nectarine are very lovely, as you can see from these images. On a side note, you can open each image by clicking on it to get a bigger image with better detail. I’ve left the images of the fruit blossoms at the same resolution that I took them, so you can see them in their full glory. And finally, I’ve got to say that I was so happy with the way that the dried persimmons came out, that I decided that I would try to grow my own. I’ve been buying persimmons from the local farmer’s market, and will probably continue to do so as my persimmon trees get established. So from my research, a single persimmon tree does fairly well on its own, but the crop yield is greatly increased when there are two or more persimmon trees planted together. 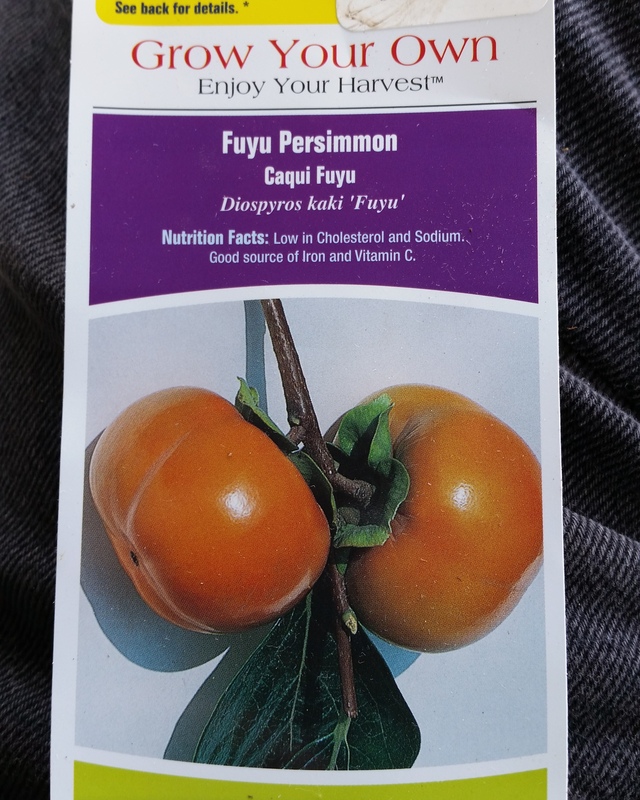 Since my local home improvement center had some good persimmon trees available, I got two. This leaves me with a problem… where do I plant them? I’ve been learning that my potted trees are not doing very well. I’m not completely sure why. I’ll be exploring that this spring to figure it out. So for now, I won’t be planting the persimmons in a pot. I’ll plant them in my yard. But where? As you can see from my yard’s plan, the back yard is out of bounds for a new tree, as is the northern dog run. I won’t plant a tree in the driveway either. This leaves the front lawn, and the grassy strip between the sidewalk and the road. 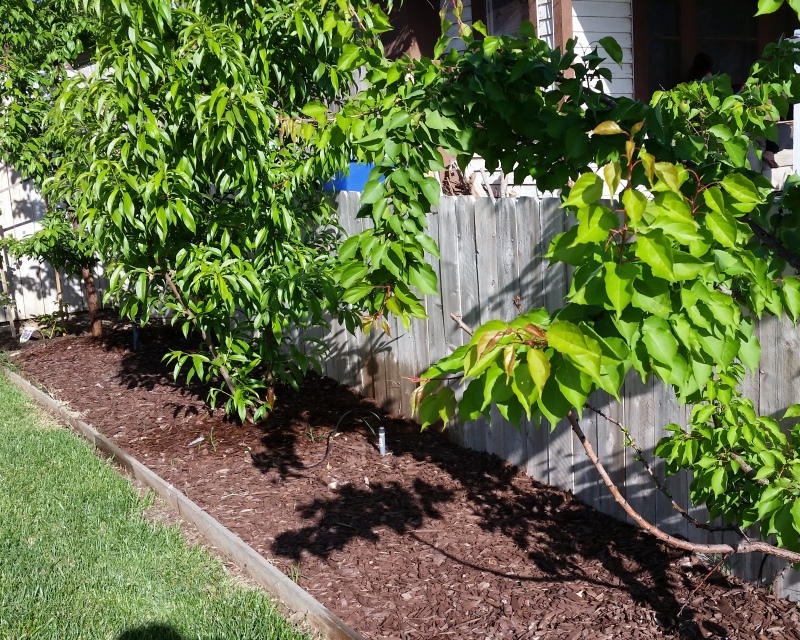 My property does have a short privacy fence just to the north of the fruit trees, so kids and strangers are not encouraged to walk across my yard… this means that my fruit trees are relatively safe from poaching. But I think that having fruit trees on the strip of grass would be putting too much temptation in front of people. Not that I mind other people having some fruit, but I prefer to give it to them. Also, I’m more cautious when I harvest, so I am less likely to damage the tree or harvest the fruit too early. I started looking speculatively at the privet tree (Ligustrum lucidum). There it sits in the middle of my yard, producing nothing but shade, and a great spot to hang my bird feeders. I do like this tree, but perhaps not that much. I planted the persimmons on each side of the tree, one to the North, and one to the South. My plan is that as the trees mature, I’ll slowly prune back the privet until it is nothing but a trunk. The wood is good, so I’ll cure it and use it in my woodworking. Right now the persimmons are just sticks, with an additional two pieces of wood used to support their trunks in case of wind. I applied tanglefoot to their base so that the ants can’t get to them either. And that’s all I have for this update. See you again, later. So the orange harvest has been going VERY well. I’ve been snacking on oranges almost every day since the first of the year. 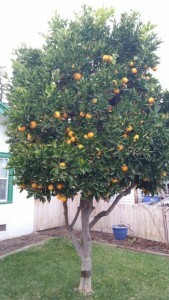 It is so wonderful to walk out to the tree, grab an orange, and just peel and eat it while sitting on my front porch. 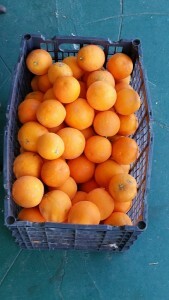 The weather has been cold and crisp, but not freezing, so the oranges are cold and refreshing. We did have a short freeze, and the tips of the orange tree’s branches have died. Just like they did last year. 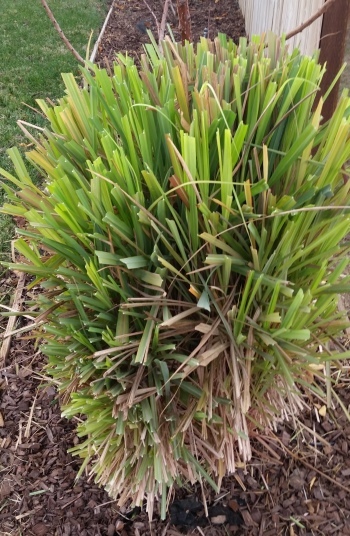 It’s really no problem, since right after harvest is a perfect time to groom the tree – cutting off the shaggy and dead branches that have grown too long. I harvested about 300 to 350 pounds of oranges this year (not counting those that we ate off the tree). Last year I tried to dehydrate the oranges, with mixed results. This year, I decided to plant a “neighborhood harvest”. By that, I mean I gave away ten and twenty pound bags of oranges to my friends and neighbors. I also donated over a hundred pounds of oranges to a church food drive. I donated almost a hundred fifty pounds of oranges to the Fresno food bank. And my neighborhood harvest has already born fruit – one family gave us a tray of danishes in thanks for the oranges, and another gave us a couple of HUGE jars of artichoke hearts. How about that? Plant oranges, harvest artichoke! 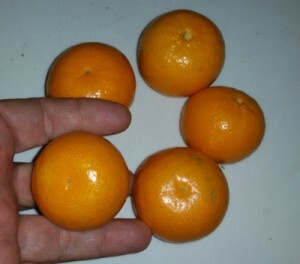 I also picked my full harvest of honey tangerines. Those two little trees had it rough last year, but still they gave me some nice, tasty fruit! Now comes the fun part – the hard work. I’ve been preparing the garden for new planting. The fun part is deciding what to plant, and where to plant it. I’ve been doing some research – and remembering some yummy treats. 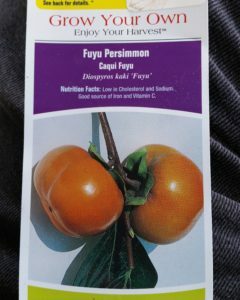 I’m thinking that I’m going to add some persimmon trees to my garden! It’s just after Thanksgiving, and the garden has mostly gone to sleep. I never did harvest the Lemongrass. It grew really big, but we just couldn’t figure out what to do with all of it. I got some of it for a couple of soup dishes, but I just cut the rest of it back. It was seriously huge and shaggy! I picked the last of the peppers at the beginning of November, and then mulched the pepper plants. 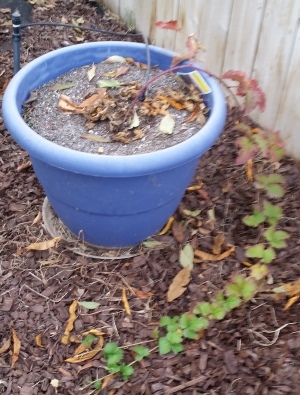 The poor raspberry bush did NOT like the pot it was in. I think in the spring I’ll replant it in the garden. And the grape vine never did have a good harvest this year either – I blame the failure of my automatic drip water system at a critical point. The grapes withered on the vine. The grapevine itself seems like it will recover just fine. My Mandarin / Honey Tangerine trees in pots also had a hard year. Like the raised bed planter, they have been having problems with yellowing and poor growth. Even so, both managed to produce a few poor little tangerines that tasted pretty good. I’ve been thinking about the complete failure I’ve had with the raised bed garden, and the failure to thrive problems I’ve had with my potted orchard. I think that the “Mel’s Mix” that I’ve used for my square bed garden is too rich, and too easily holds water. The plants in the raised bed garden yellowed, dropped leaves and then died. The trees have yellowed and failed to thrive. This is usually a sign of too much nutrients – like water or fertilizer. The containers are probably too wet near the bottom, and the soil is probably way too rich. I’ll do some experimenting in the Spring. I’ve also been worried about the drought’s effect on my orange tree in the front yard. The oranges are still not quite ripe, but I think they will turn out okay. If they do, then I’ll pick them in late January and early February. Here’s a good turn… the local persimmon crop is going well. I’ve been purchasing persimmons at the local farmer’s market by 8-10 pounds at a time, and then dehydrating them. You know how hard it is to get a persimmon that is just right? Eat them too early and they are often bitter with tannin, eat them too late and they are a syrupy mush! 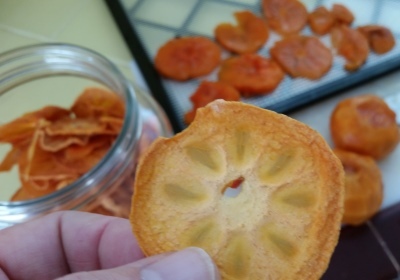 Well, dehydrating persimmons fixes that! I first had dried persimmon in South Korea, where they are treated like candy. There’s even a story that my late wife told me, long ago, about how dried persimmon’s frightened away a dangerous tiger because they were so delicious. 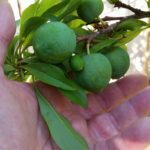 If you dehydrate a persimmon before it is completely ripe, it may not be as sweet, but it will completely lose the bitter flavor of tannin. If you dehydrate an overripe persimmon you can do so the same way you would dehydrate fruit leather. Either way you get something that stores well and tastes great. But if it is just ripe, and seedless, then you can cut it into slices on a Mandolin slicer and dry them on the trays. You can do so with skin on if you wish, but they taste better peeled. Okay, that is all for this year. I’ll write again in the New Year. I’m still not sure if we will stay in this house, or move to follow whatever new employer I’m working for. I’ve got some ideas about working freelance and contract which I think I’ll be exploring. Until I know for sure, I’ll continue the garden, and make plans for an aquaponics system. When I was in the Air Force, I was stationed in South Korea for two years – where I met my late wife. After Korea, we lived in Okinawa Japan for another 6 years. I’ve enjoyed Korean food for over 20 years, and since my wife passed away I’ve learned to recreate some of my favorite dishes. I’ve also started experimenting in ways that I’m sure would have scandalized my late wife. This is one of those experiments. A stir fired rice using fish and Old Bay Seasoning. Old Bay Seasoning is something I grew up with in South Texas, and while I was stationed in Mississippi. It is the taste of my youth, crab boils, and fish frys. And it goes together surprisingly well with fish fried rice. Anaheim peppers (red and green), fresh from my garden. 1) Add olive oil to either a heavy bottom pan or wok, and heat over high heat. 2) Add garlic and onion. Stir fry until light brown. I purchase minced garlic in a jar, like this. It bypasses all the work of preparing garlic, and it tastes much better than powdered garlic. Plus you can brown it. You can find it in larger jars if you use fresh garlic more often. I love the garlic flavor in fried rice, so I use two tablespoons of garlic. 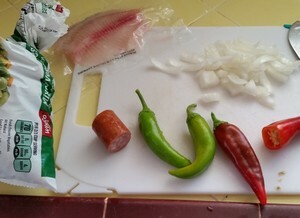 3) Add the fish, Kielbasa, veggies and peppers. Stir fry for about 3 minutes. The idea here is that the fish and Kielbasa is cut into smaller cubes so that both cook quickly. 4) Add a tablespoon of Old Bay Seasoning while continuing to stir. This flavor mixes well with the fish and sausage flavors. 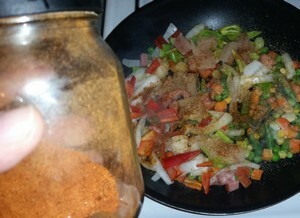 5) Add a teaspoon of chili powder while continuing to stir. You might want to omit this step if you don’t enjoy hot stuff. Or, if you are like me, you might choose to increase this amount! Of course rice is what makes this Fried Rice – but rice itself can be an issue. Long grain, short grain, boiled in a pot, cooked in a rice cooker. Americans are used to long grain rice that falls apart on the plate, while Japan and Korea is used to short grain rice that sticks together, and can be formed into sushi rolls. 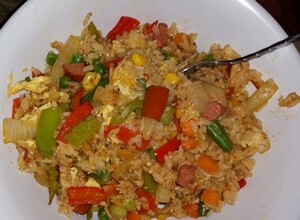 When I lived in Korea and Japan fried rice was made with short grained rice out of the rice cooker. To do this, it was dropped in a lump on top of the other ingredients in the pan, and then the edge of the edge of the spatula was used to “cut” the rice into smaller and smaller portions, stirring and turning until all the rice is coated with the oils and ingredients. Any remaining balls of rice are further “cut” into the mix, until it all achieves a “fall apart” consistency. If you don’t want to take the trouble of boiling your rice, or purchasing a rice cooker, then you could use pre-packaged, cooked rice. I’ve done this with Korean rice and enjoyed the results. However, it is an expensive option, and I don’t think it is quite as tasty as a good brand of short grained rice from a rice cooker. 7) Add the egg, let it cook while stirring the rest of the pan, then mix it in. 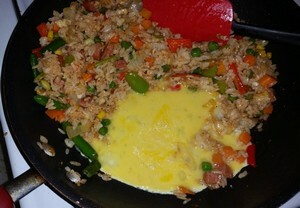 Koreans will often add a fried egg to the top of fried rice. Sunny-side up, or over easy, or just beaten like a plain omelet. Japanese will often cook the egg next to the fried rice, and then mix it in. I like to have it mixed into the fried rice. The idea is to make a space to cook the egg, so that you get chunks of cooked egg in the rice. You can keep the rest of the rice moving as you stir it, and then as the egg gets firmer, you can mix it into the rest of the rice. 8) Add two tablespoons of Oyster Sauce. Stir fry for another 2 minutes. Be careful in this step! The rice and the Oyster Sauce will both want to caramelize. Keep stirring to prevent this! 9) Remove from the heat, add 2 teaspoons of Sesame Oil, and stir. I love how this comes out – I love how the aromas of Old Bay Seasoning and garlic and Kielbasa and fish mix together. 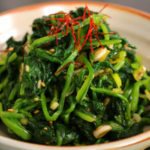 You can garnish with chopped, fresh green onions. Some people like to add cheese to this too. Eat it with a spoon! In Asia, no one really tries to eat fried rice with chopsticks unless they are being silly. I was told that eating fried rice with chopsticks is seen as a bit gauche. Well, it’s been fun. But I need to concentrate on other areas of my life right now. As I’ve mentioned before, I was laid off of work in December of last year. This didn’t panic me, because I had a nice bit of savings and I was really looking forward to spending time pursuing my hobbies, being with family, and just decompressing and brushing up my skills. But all good things must come to an end. So I’m starting some freelance work while I start job hunting. What does this mean to Fresno Backyard Harvest? As of right now, I’m putting my aquaponics plans on hold. I may continue to build the electronics portion of my aquaponics system because that’s good practice and it keeps my electronics and firmware skills fresh. But I won’t be breaking ground on the greenhouse until I am more sure of my income. I’m also putting off upgrades to the woodshop. This means no air conditioning! Which means I’ll not be in there very much this summer. I’ve still got to put together some bookshelves though, so I’ll probably brave the weather for that. I’m also starting with a job placement program, and will be creating resumes and a plan to find a new job. Of course this means much less time for garden upkeep and maintenance. I expect I’ll run into some crop failures due to this, and am prepared for that. As I have said, I will be doing some freelance work, and if you need a Tech Writer or electronics engineer with an affinity toward embedded systems, then I ask you check me out at mdboyd.com or at my LinkedIn profile. I’ll still be maintaining the Backyard Harvest, and will still keep you updated. So keep coming back!